Bamber Bridge boss Neil Crowe is looking to boost his squad after receiving some bad news about star winger Ally Waddecar. 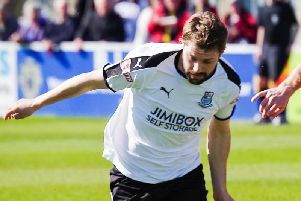 Crowe is hoping Waddecar will have a scan on his injured knee – sustained against Lancaster City more than three months ago – in the next 10 days but believes the midfielder could need keyhole surgery to fix his problem. That means Waddecar could be missing for longer and with Stu Vasey (leg) and Phil Doughty (dead leg) set to miss tonight’s away clash at Mossley in the NPL First Division North, Crowe is keen to bring in some new players to bulk up the squad. He said: “Stu I thought it was worse than what it is, he is still in pain and he is doubtful for tonight. “Ally is having a scan and hopefully that will happen in the next 10 days. “It has been suggested he might need key hole surgery. “He will be out for a bit longer which is a massive blow. Phil Doughty will miss tonight because of a dead leg. “We are looking to bring in a couple of players. “There is no specific area we just want to boost our numbers.” Brig are 10th in the table having won only once in their last eight games and Crowe wants his men to hold their heads high after giving their all in Brig’s narrow 1-0 defeat to Droylsden on Saturday. He said: “I don’t feel we should have lost. We did enough to get a point minimum. “They had a scrappy goal and our keeper Steven James never had a save to make in the second half. “We had a goal scrubbed off and a clear penalty waved away. “But the lads gave everything on Saturday. “Before the game I said just give us everything you have and they did that. “We will play worse than that and win games. Brig now head to Mossley tonight a side they beat 4-1 at home back in September and Crowe expects them to be out for revenge. He said: “It is a tough place to go to be fair. “It is not the best pitch. “We beat them earlier in the season so they will be looking for revenge.